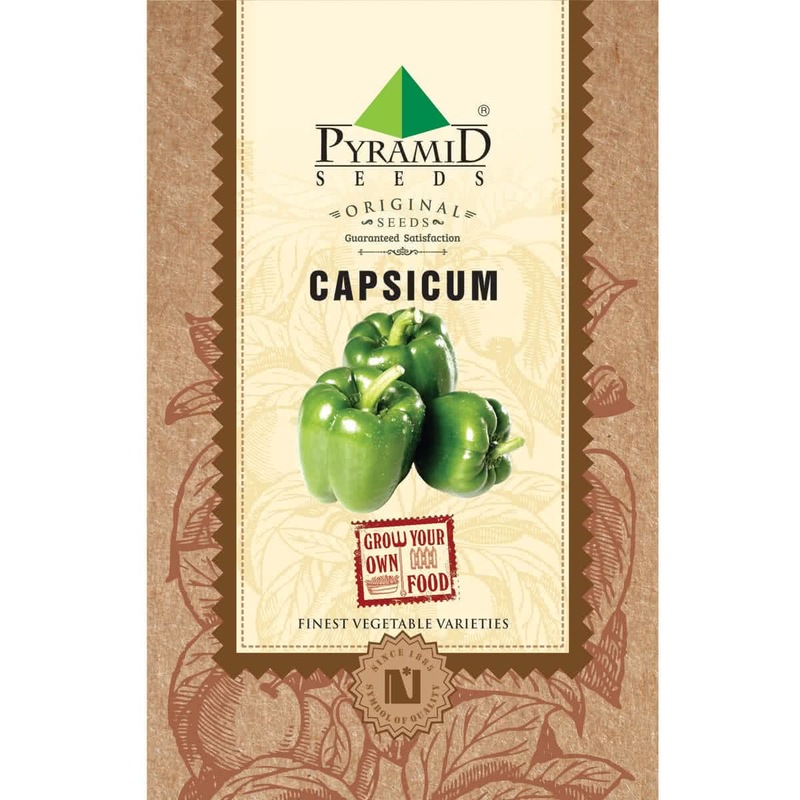 Capsicum is available in a wide range of luscious red, yellow, green, black and purple colors. Cultivated globally it is mainly used as a pizza topping. Introduction and Uses: Capsicum is also known as Simla Mirch or Bhopli Mirchi. Did you know that Capsicum is used to make medicines too? These plump, bell shaped, crunchy vegetables can easily grow in different types of climate. Loaded with Vitamins A, B6, C and K, carotenoids, dietary fiber and folate Bell pepper helps to lower homocysteine levels, and reduces the risk of heart disease considerably. Because the seeds are small, Capsicum plant is grown by transplantation method. Seeds are first sown indoors in seedling trays or outdoors on seed beds. Later the seedlings are transplanted into containers or in raised beds. Hold the Capsicum seeds on your left palm & sow 2-3 seeds per cell/cup. Since Capsicum seeds are small, avoid sowing them very deep. First leaves: First leaves will emerge above cotyledons at the end of the second week. These are Capsicum's original compound leaves. Ideal planting mixture for Capsicum: 2 part garden soil & 1 part Organic Manure. Sunlight: Capsicum plants require full sunlight in winter & partial sunlight in summer. Therefore, place your raised beds & potted plants according to season. Watering: Water your potted Capsicum plant every day in summer & every other day in winter. Water at the soil near the plant. Use a watering can and make sure that the plants get water in the form of a shower & not by a single flow. You can also make provision for watering by drip irrigation system for your raised beds. Avoid overwatering. 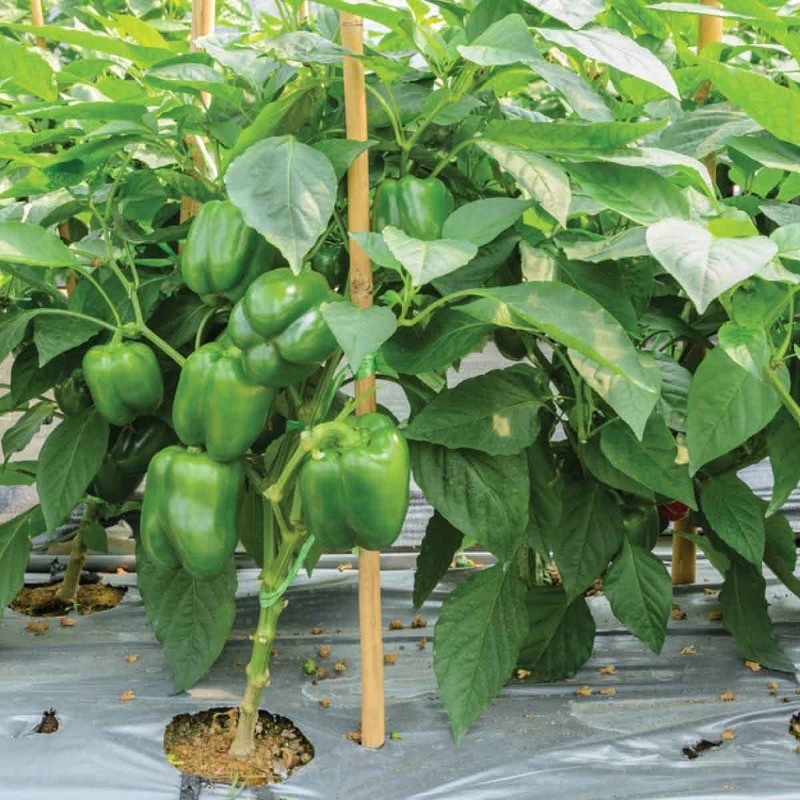 Support: Support your Capsicum plant by tying its main stem to a single erect stick buried in the soil near the plant. With this support, your plant will stay upright. Pinching/Topping: Pinch out the apical (top) growing point of Capsicum plant when it is 2 months old to encourage new and uniform side growth. This will increase the chilly production. Also, pinch off any diseased leaves & branches immediately. Harvesting: Capsicum plant will start flowering at the end of 3rd month. Capsicum can be harvested 70 to 80 days from the sowing of seeds. If proper care is taken. Harvesting season can continue for 4-5 months or more. Approx. 92 to 102 Seeds in 500 mg, 4545 to 5050 Seeds in 25 gm, 18180 to 20200 Seeds in 100 gm, 45450 to 50500 Seeds in 250 gm.